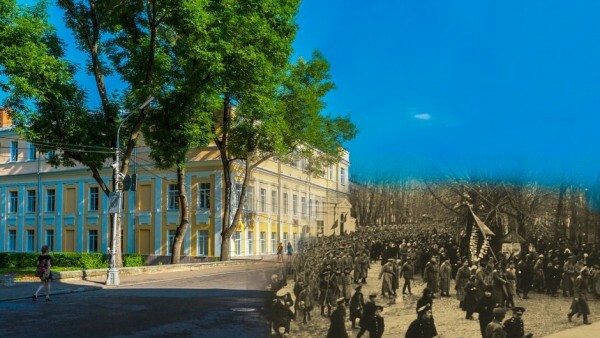 This poetic introduction, an excerpt from the poem «For The Descendants» by Maximilian Voloshin, currently reflects the fate of the cultural heritage, as well as possible, «The house in which in 1917 was the Workers and Soldiers Deputies Soviet and the Military Revolutionary Committee. Here, in 1925, spoke the leader of the German Communist Ernst Talmann». The building is located in the central part of the city along the October Revolution street, the Building 8. The two plaques placed on the facade of the building suggest about the facts, mentioned in the title of the house. Many citizens know the building with that address as municipal budget educational institution of children additional education «Children’s Art School. M.K. Tenisheva «, which is also reflected in the rating plate on the front of the school building. The only thing, on the facade of the building, unseen for the resident and visitor, are messages, that it was built under the Smolensk Governor Nikolai Vasilyevich Repnin in 1781 in the number of buildings, that were built according to the first general plan of the city as an administrative building around the newly formed parade square. The third floor was built in 30 years of the 20th century. In this house in 1829-37 lived the governor of Smolensk, a direct descendant of Bogdan Khmelnitsky N.I. Khmelnitsky (1789-1845), a Russian playwright and translator, who was personally acquainted with the great Russian poet Alexander Pushkin and led correspondence with him. Nikolai Khmelnitsky showed great concern for the improvement of the provincial center. It was through his direct participation the Blonye park found the form, which is familiar to every Smolensk citizen now. After all, from the late 18th century it was parade on the Blonye, ground on where the cavalry was prancing, the infantry was marched, raising dust. From there, the whole neighborhood resounded loudly the military command, the one heard a horse neighing. In short, the stable yard, but not the main area of the city. With the blessing of Emperor Nicholay I, and with the support of the Treasury, rolled up sleeves, took a new governor for the cause. And he, indeed, sometimes literally rolled up sleeves, because when he had decided to turn the filthy and dusty ground into a flourishing area, personally planted on apple trees, together with knowledgeable people involved in planning the garden. And, of course, since the governor himself does not disdain to dig into the ground, all the officials, leaving the government offices, going out on voluntary Saturday and Sunday work, as we can say now. There were also avid gardeners, who picked up the special wood. But one way or another, the progress was very successful: garden grew and blossomed, becoming a favorite destination of Smolensk citizens. But not only for the Blons Park ennobling activity of the Smolensk Governor N.I. Khmelnitsky was remember. On his initiative, in 1831 the city created a public library with room for reading, organized by Russia’s first provincial exhibition of industry and agriculture objects. And now it’s time to go back to the epigraph at the beginning of the story, «Who will give our story to the descendants?» According to the passport of the object of cultural heritage, «the building have the great matter as a monument to the history associated with the establishment and consolidation of Soviet power in Smolensk and the province, with the names of prominent government Revolutionary leaders, as well as the name of the leader of the German proletariat Ernst Thalmann «, which served as the basis of its inclusion in the list of objects of cultural heritage is not even the regional and federal. Events, which happened in the first quarter of the 20th century, had weight in Soviet Russia, but to be honest to the end, the true descendant should not and has no right to limit ourselves only to these facts. Indeed, despite the importance expressed above, we can not fail to see the state of the building soul on the October Revolution street, Building 8, which is so magical, year after year gives us park called Blon.